LG is all about the cinema-feeling with its new EA93 monitor which offers a ludicrous yet weirdly alluring 21:9 aspect ratio. 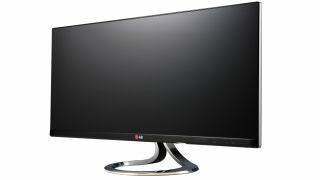 As well as LG's 'Cinema Screen' design, the 29-inch monitor offers high-quality lifelike colours (LG's words) thanks to the IPS monitor's 100 per cent sRGB colour space and 300nit brightness. Response times come in at GTG 5ms. If you're a multitasker by nature, you can use the 4-Screen Split feature to divide the display into four segments, or even link several gadgets up to the monitor at once using the Dual Link-up function. This means you might be able to get by with just the one mega-wide monitor instead of a dual-monitor set up. Visuals aside, the EA93 also offers 7W stereo speakers and two HDMI ports, a USB 3.0 jack, one DVI-D (dual) and two display ports. No word from LG on how much it'll be selling the LG EA93 monitor for, but since it didn't offer a release date either, we guess we'll just have to wait and see.